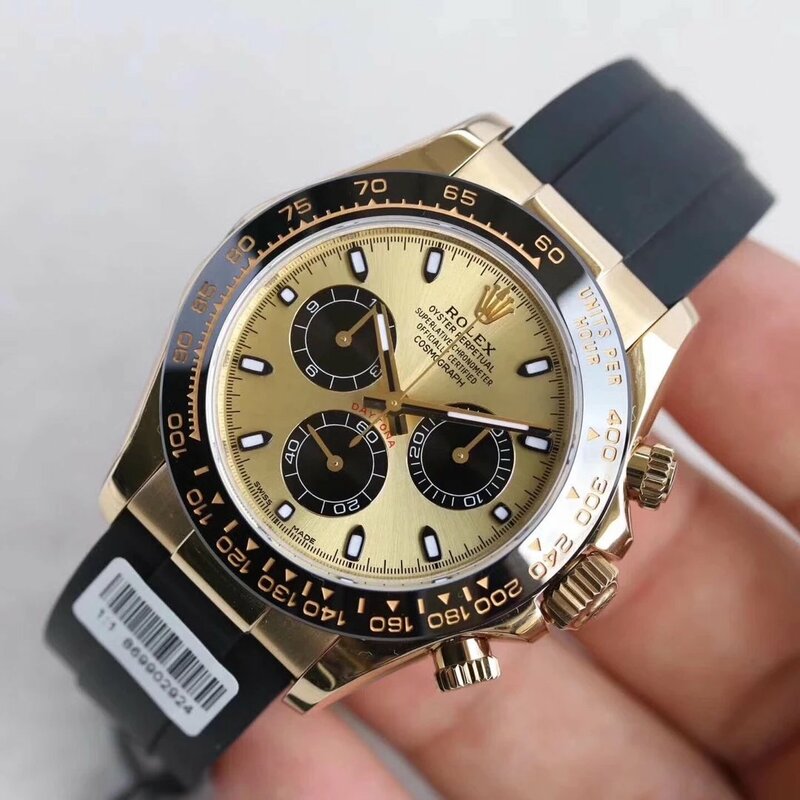 I introduced several Daytona watches on my site, there are steel Daytona, Rainbow Daytona and the most popular vintage Paul Newman Daytona, I like Daytona watch because it is the only Rolex that not only features sporty style but also made of precious metal. 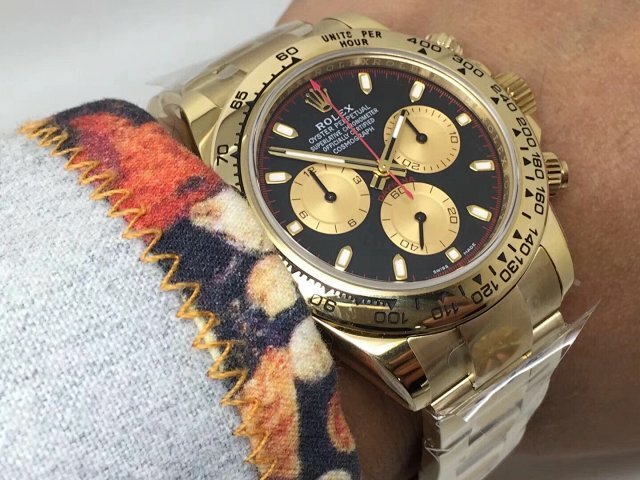 Rolex Daytona watch could fit your any types of dresses, like business suits or sports clothing. 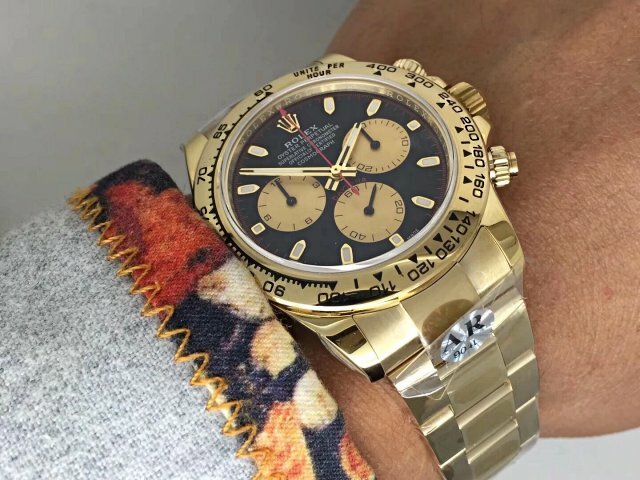 Many watch fans prefer those Rolex watches with steel bracelet, but I think the one with rubber band is also attractive. 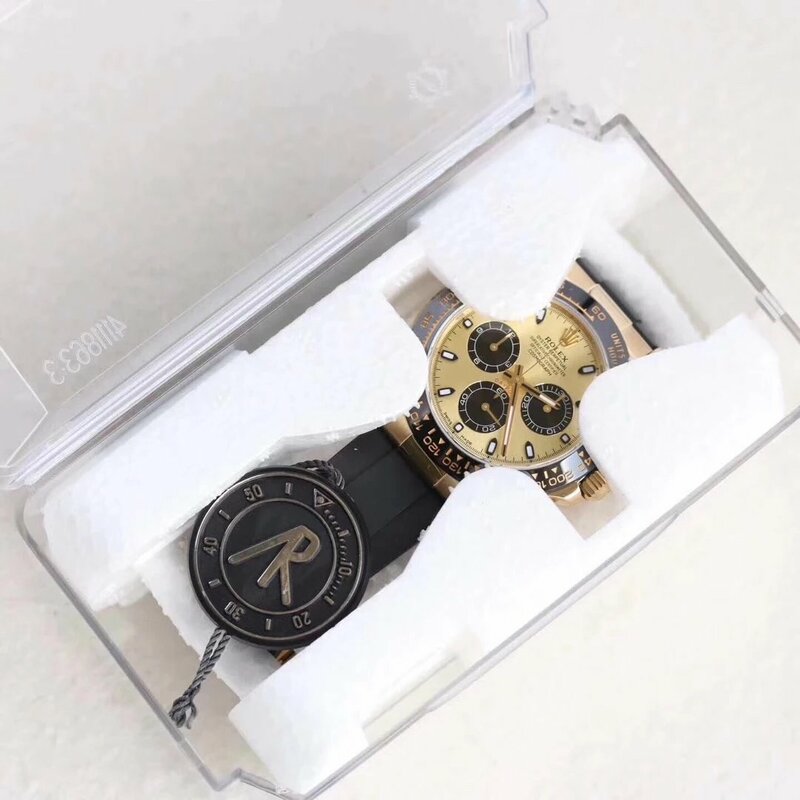 I prefer wearing Daytona watch, it is very convenient for me when I am doing some sports, the chronograph function is specially designed for those sports lovers who like competition. 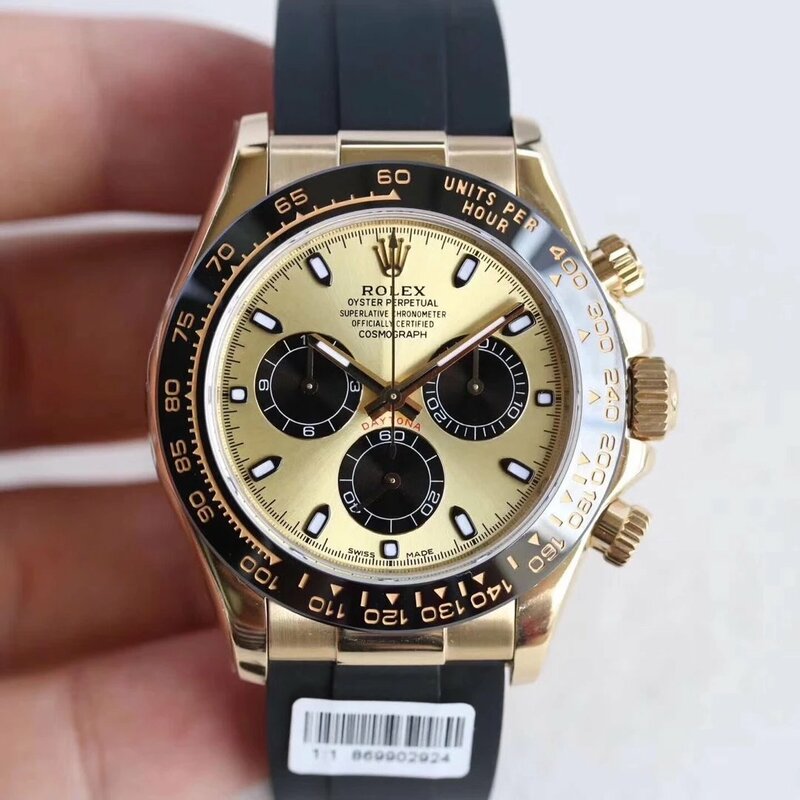 Today, I will introduce another fusion art, although many people Hublot is more worthy of this title, this Rolex Daytona is a good combination of precious metal and rubber material. 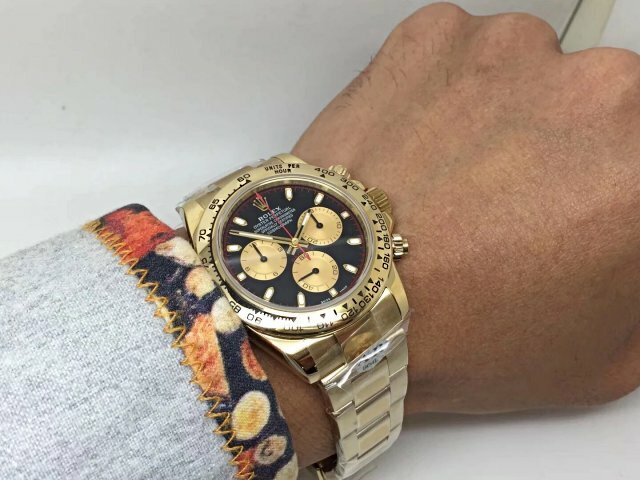 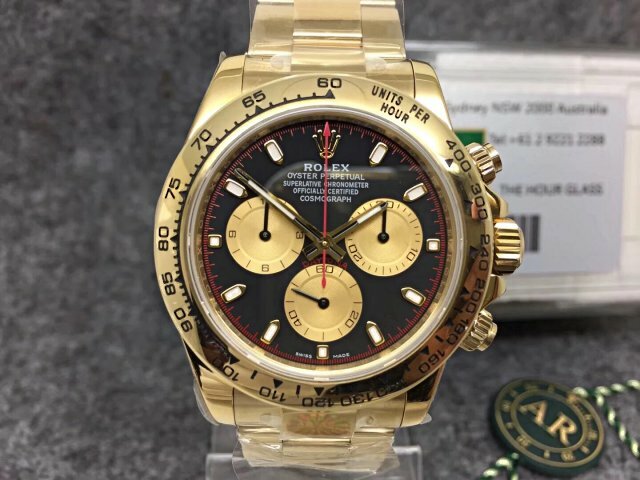 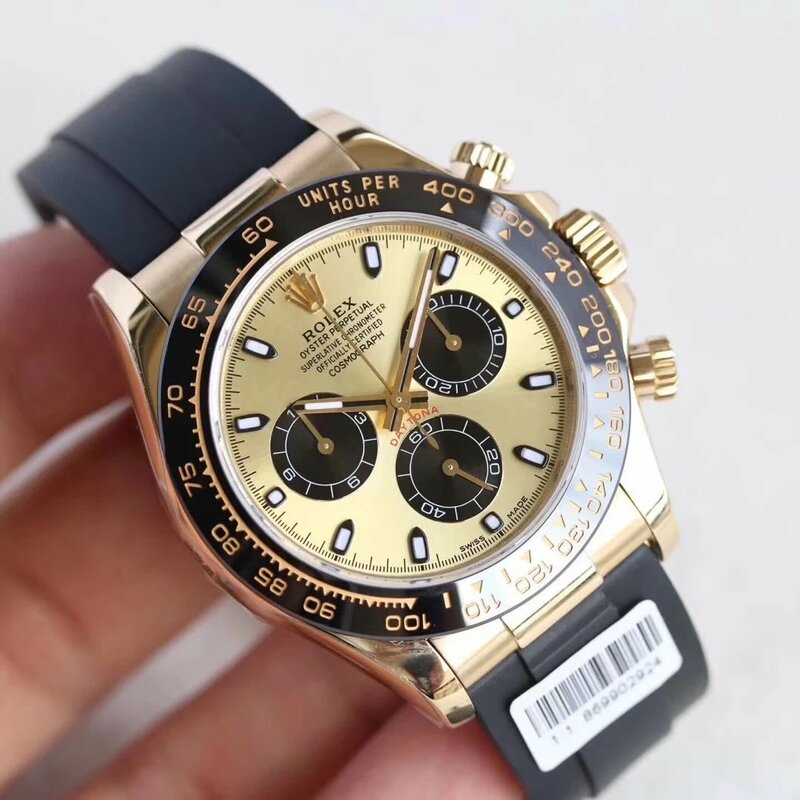 This watch I am going to introduce in the following is Rolex Daytona 116518LN replica, it uses four materials, which include stainless steel, yellow gold, ceramic and black rubber. 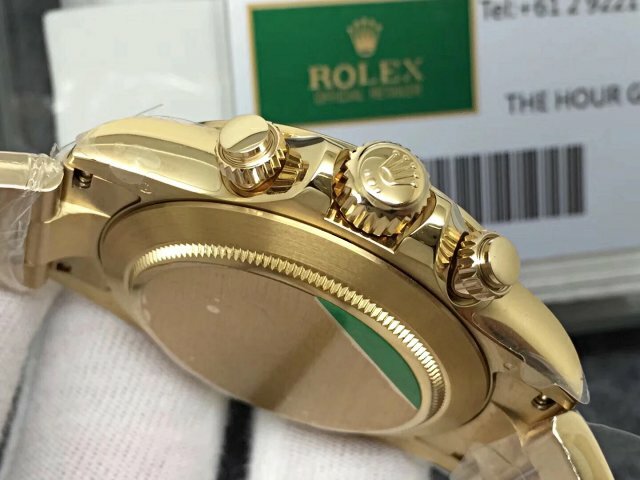 Now, let’s read its specification first. 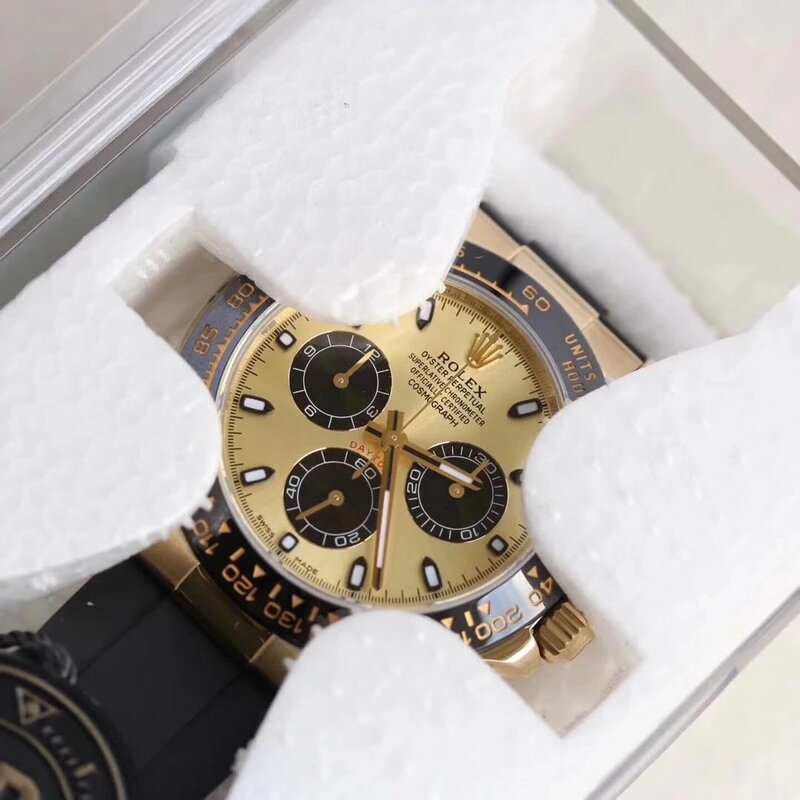 First, I must see it is a dream watch for many Rolex fans because the replica watch uses a lot of high-tech watch materials. 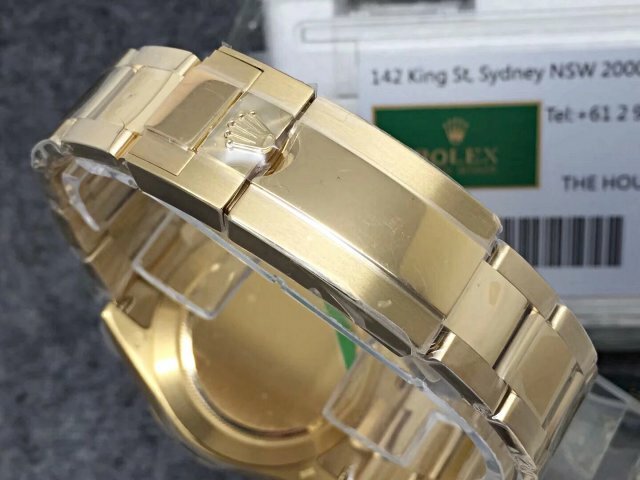 The case is made of solid 904L stainless steel, you know, 904L steel is only used on genuine Rolex before, but now AR factory uses this steel material on replica Rolex, this is a great breakthrough in fake watch industry. 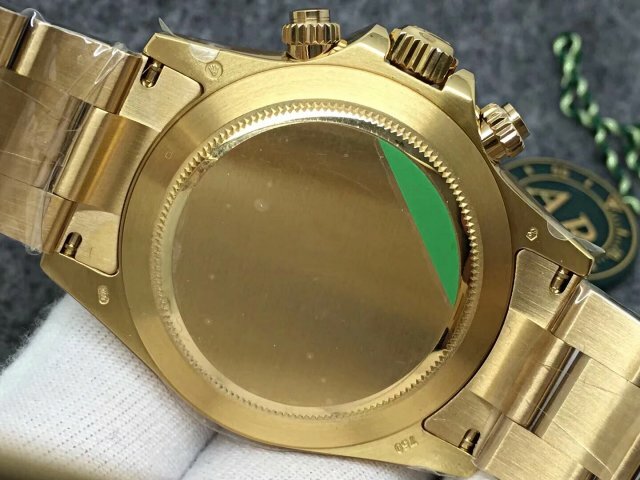 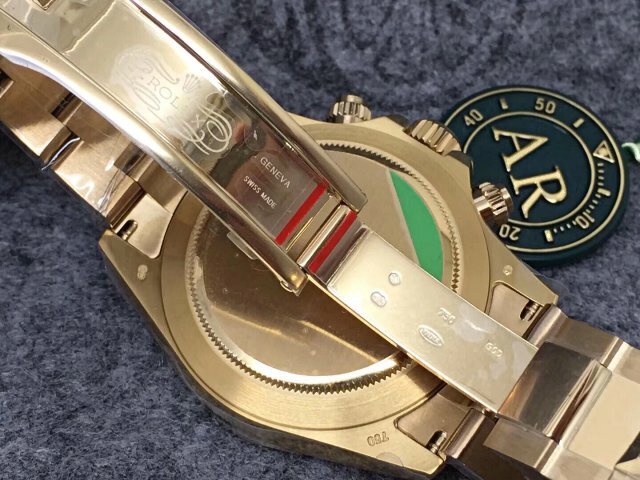 There is a thick layer of 18K yellow gold on the case, it is about 5 mils, the wrapped gold coating, which will not fade easily, I have to say the gold coating will not be worn even after three years of wearing. 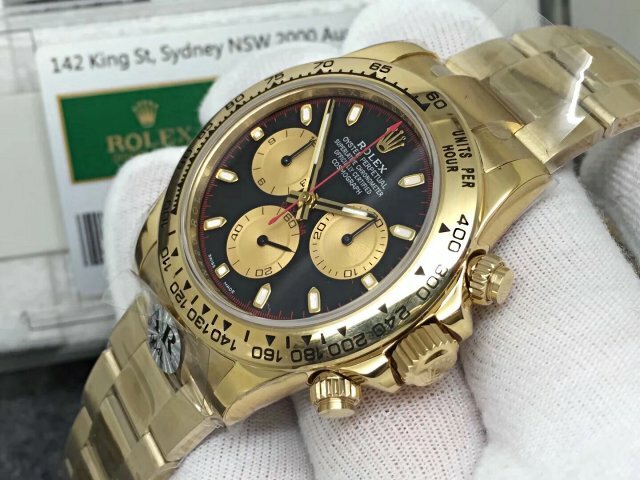 I think this is the main reason why this Rolex 116518LN replica is much more expensive than other Rolex Daytona watches, it has too many big selling points. 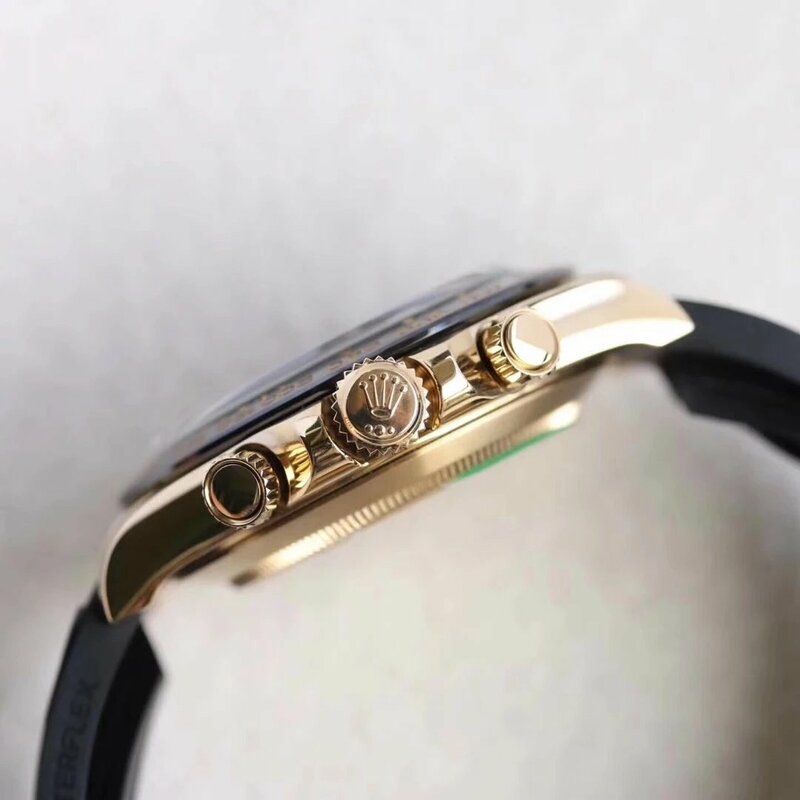 Second, the bezel insert is made of black ceramic, Tachymetre scales on bezel is in yellow gold tone, which exactly echoes with the gold dial and case. 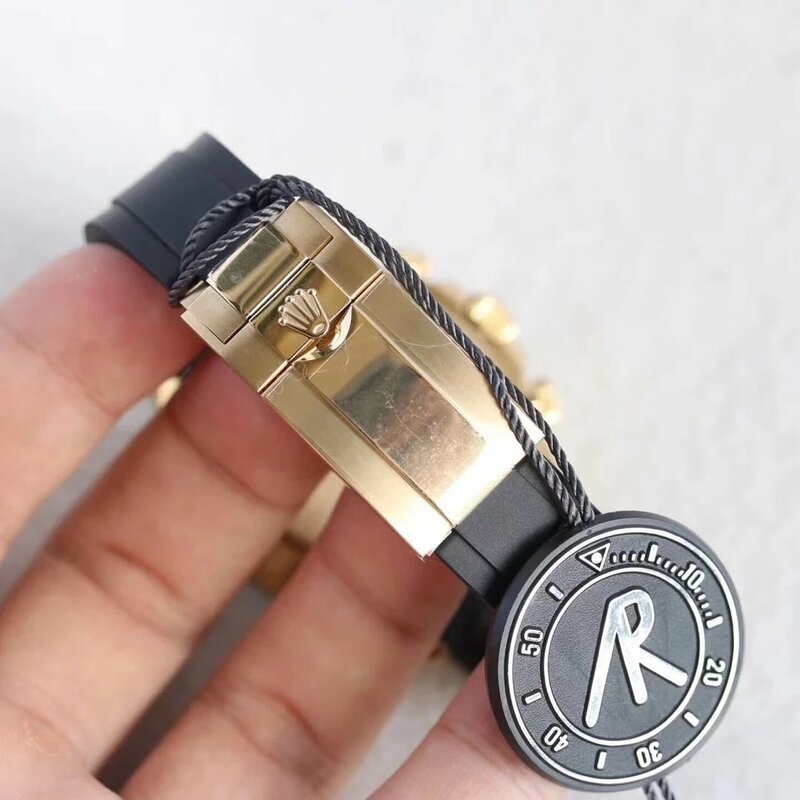 Black rubber band adopts the most natural rubber material imported from Thailand, it is soft and durable, most importantly, the rubber band does not have smell and perfectly fit your wrist. 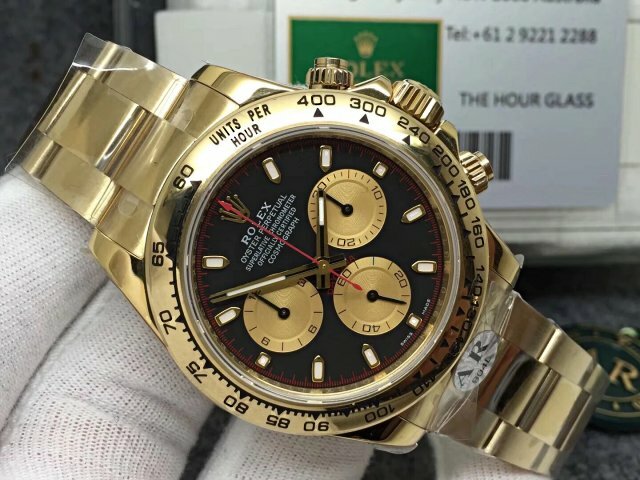 Let’s check the golden dial, three subdials work the same as genuine, the subdial at 6 is for small seconds display, 30-minute chronograph counter is at 3 and 12-hour chrono counter is at 9. 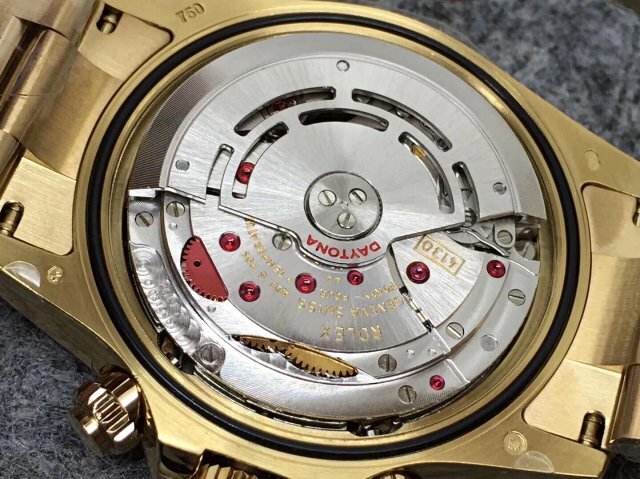 When you unscrew the button at 3 and push it, the second-chronograph hand on the centre will start to work. 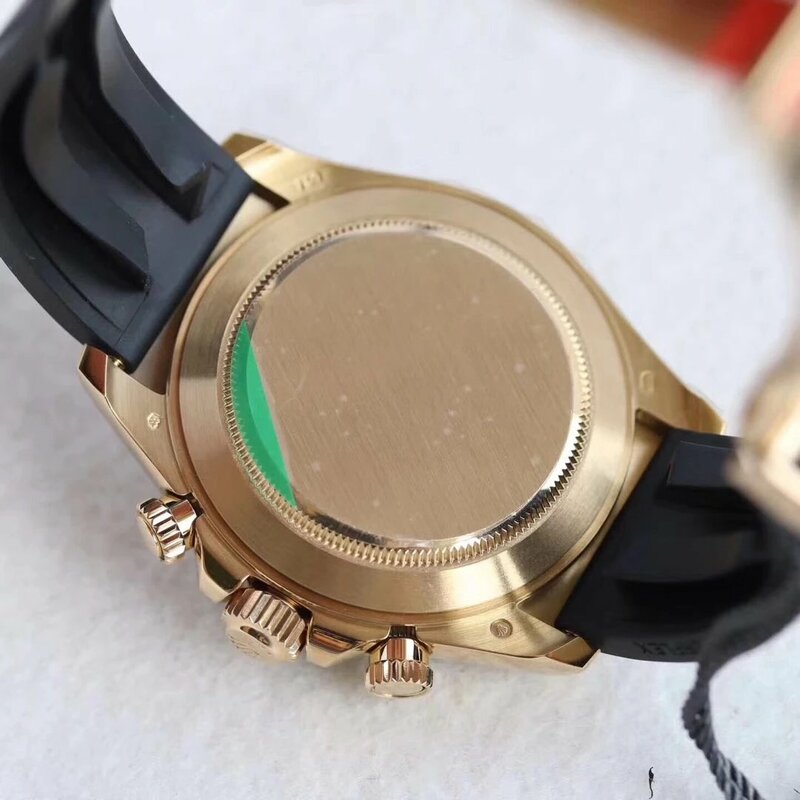 Hour markers, hour and minute hands are all applied white luminous material. 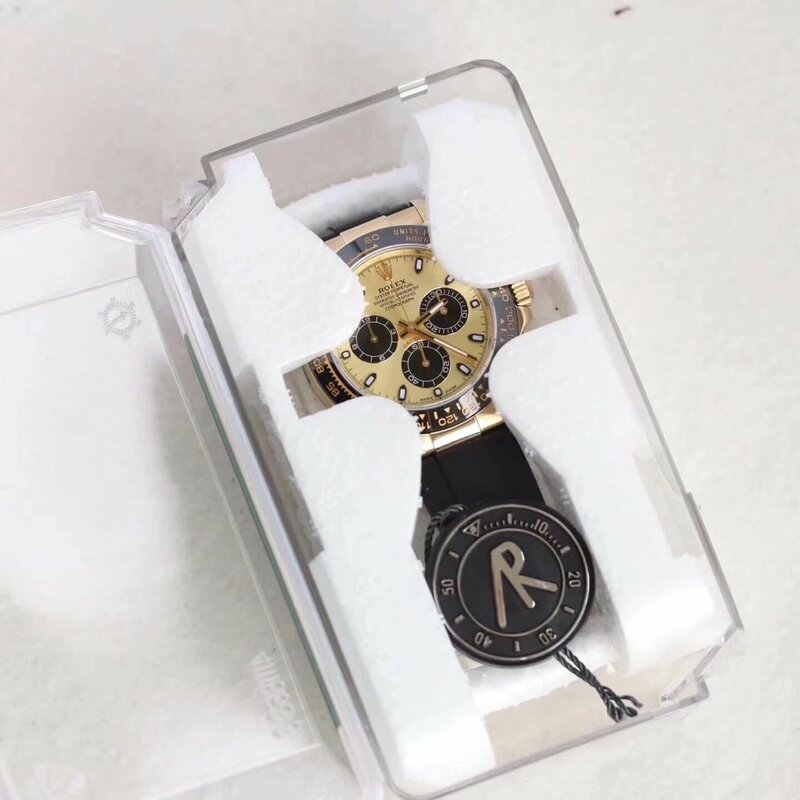 Finally, inside the case, the movement is a clone Rolex 4130, AR factory made a lot of effort to build this movement to make it work slim and better. 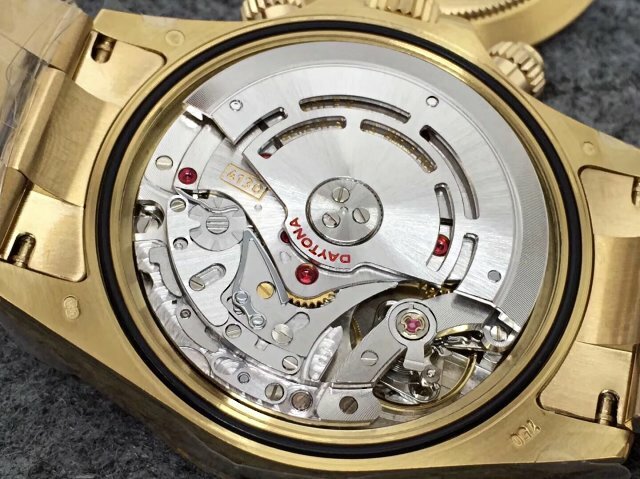 Although this clone 4130 is modified from Shanghai 7750 chronograph movement, the movement plates and auto rotor are decorated to the look of real Rolex 4130. 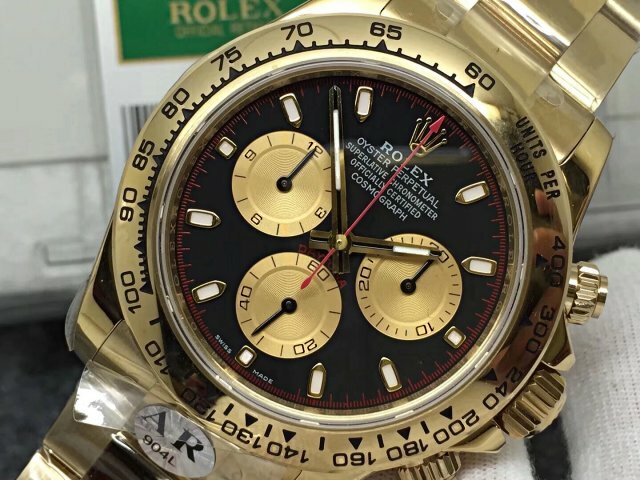 Besides, the small second hand and chronograph will work much slimmer. 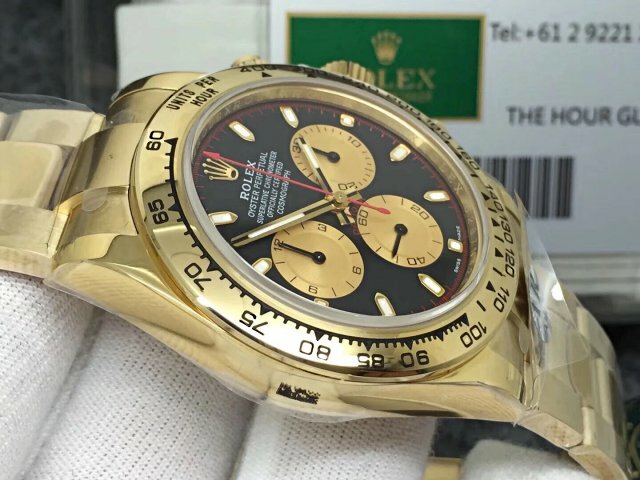 In a word, when there is new Rolex models published each year, there will be more exicting news coming from our replica watch factories. 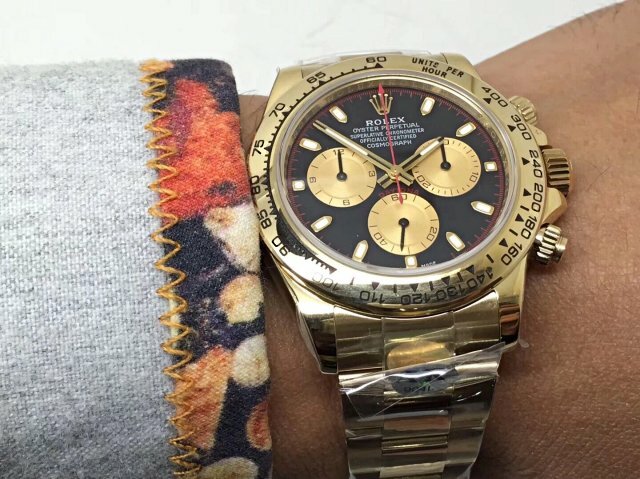 We will introduce more high end replica watches in the future.